The Temples. The Tuk Tuks. The Kings Birthday. Bangkok is one of my favourite cities and here is why. Before we went to Thailand a lot of people told us to only spend one day in Bangkok. HELL NO. There is so much to see and explore here. I love Khoa San Road! People may say it’s tacky and full of drunk tourists (not denying it isn’t) but just take a day and GET INTO IT. The number one thing I always tell people when they are going to Thailand is pack half the amount of clothes you think you are gonna need because you are definitely gonna want to get your shop on. Seriously! You are also giving back to their economy by shopping so take advantage of the cheap prices and go for it! Thai street food is everywhere. Yes, you do need to be mindful with what you are eating because sometimes things have been sitting out for a little while and you may get a bit of Thailand Tummy. Every morning on Khoa San I would get myself a freshly made Pad Thai and it was amazing. But the street food is everywhere and you need to dive in, just maybe skip the scorpions. A must do! This was an experience like nothing I had ever done before. For about the price of a coffee in Canada have a Thai masseur climb, yes climb, all over your body and bend you in ways you did not know were possible. There are massage shops set up all over Khoa San Road and we got a massage almost everyday we were in Bangkok! Take a ride through the back water and backyards of locals. Get a small glimpse into the lives of the 8 million people that live in Bangkok. We also saw Wat Arun temple from the river lit up at night and it was breathtaking. With all the activities above, MAKE SURE TO BARTER THE PRICE. If the name doesn’t sell it for you then I don’t know what will. It is the official residence of the King and the intricacies in the architecture is gonna have your eyes popping! Thailand is full of temples! Sometimes it can be a bit of temple overdrive but we recommend getting to these sites early in the day to try and avoid the crowds and the heat! Hot Tips: Make sure you are wearing long pants and shirts when visiting, people at the gate will not let you in if you are not dressed appropriately - make sure it is light as Thailand is hot. Another Bangkok bucket list item to be sure not to miss out on. The grandeur and size alone of Wat Po is worth the crowds. These two sites are a five minute walk away from each other so make sure to see both while you are feeling energized and fresh. For some more low key architecture make your way out of the overcrowded, touristy area and bathe in the tranquility of these two spots. You may be lucky enough to see some Buddhist Monks ceremonies like we did. 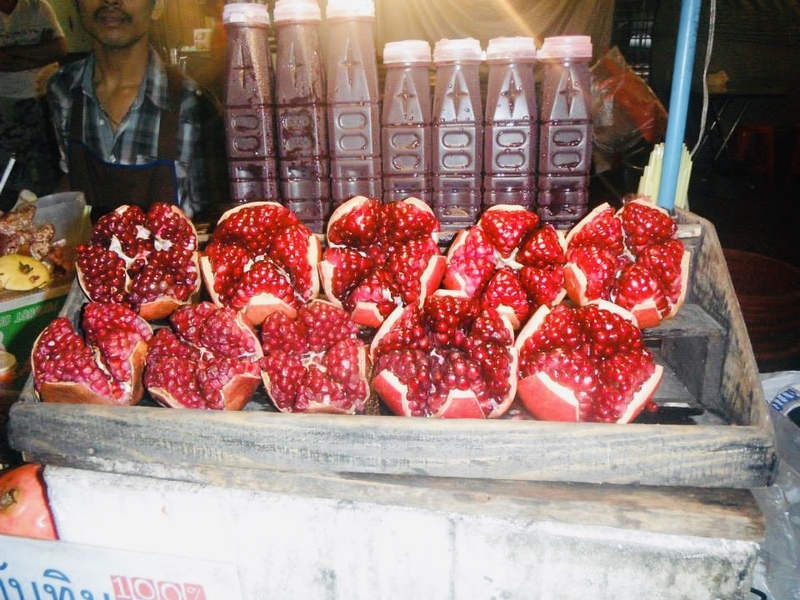 Grab some fresh mangos and take in the beauty and feel the spirituality of everything around you. For something totally different, head over to this market and get your shop on. Thailand is an extremely inexpensive place to play so if you need any souvenirs head on over! Give yourself time! This is the biggest market in Thailand and it has more than 15,000 stalls, divided into 27 sections! Talk about shop till you drop. Thailand is in love with their king! The previous king passed away in 2016 but prior to that the locals would go wild on his birthday (Dec 5th). We just happened to be in Bangkok for this and a TukTuk driver tipped us off about his birthday party happening in a park! 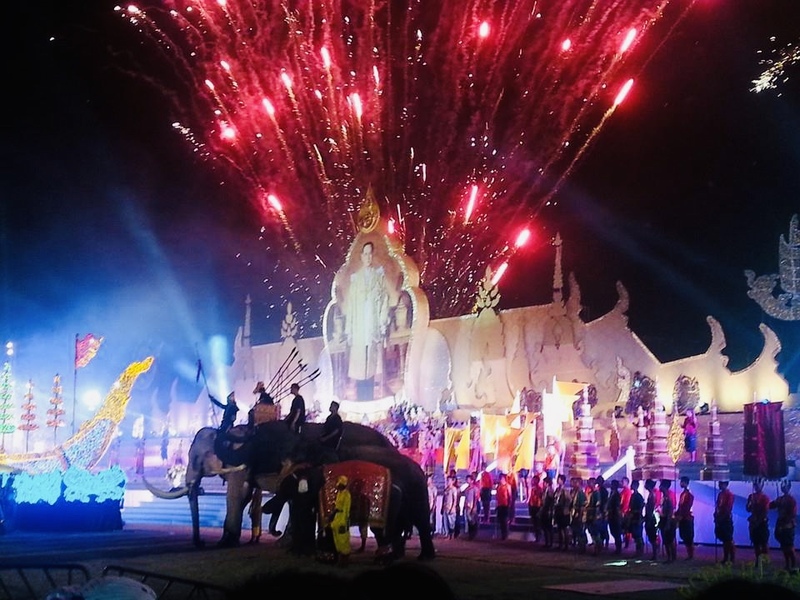 Elephants, floats, warriors and fireworks; it was incredible. The current King’s birthday is on July 28th so keep these dates in mind if you will be in Bangkok around this time! Bangkok has lots of the different types of areas to explore. It super easy to hail down a TukTuk, or cab, but we also recommend using the subway as well! It’s super affordable and extremely clean! It put our transit system here in Toronto to shame! Bright lights, shopping malls and lots of festivities on the street. Jump on the subway and head over to modern Thailand. Think of it as the Times Square of Bangkok, definitely worth a gander. This is Bangkok’s red light district. Bright pink lights line your street and tons of bars are packed underneath them. We ended up in a lady boy strip show, which is quite common in that area of Bangkok. It was quite a cultural awakening and unique experience, definitely something to feast your eyes on. I love going to all Chinatowns across the globe and Bangkok’s is one of the biggest in the world! Hit up Yaowarat Road at night as it turns into a street food paradise! We loved our home on Khoa San Road, Rikka Inn. Since Thailand is so inexpensive we ’splurged’ and got a hotel! It was about $30CAD a night and had an incredible roof top pool that looked directly onto Khao San Road. Khao San Road does have a rowdy reputation but our room was silent even being steps away from all the action. If you want a cheaper alternative we recommend Khaosan Immjai. It’s a short walk away from Khao San Road, so you are still close to all the action but with dorm style accommodation you can stay for about $7CAD a night! Sadly we ran out of time to make it to the original capital of Thailand, Ayutthaya. On our next trip back to Thailand this short journey over to the island is high on the list. 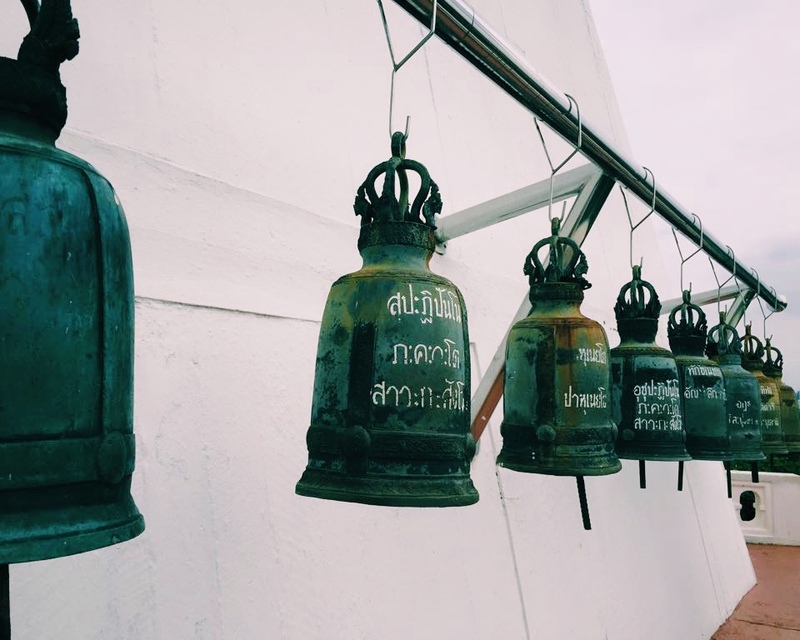 Monasteries, temples and statues showcase the ‘old city’ and gives a glimpse into the past of Thailand. You can pop into one of the MANY tourists shops on Khao San Road and BARTER down a price on a day trip out to Ayutthaya.